Hedge apples have a long standing reputation as a spider repellent. This is a guide about using hedge apples to repel spiders. Do I put them out whole or cut them in half? How many do I put in each room? They should only be used outside the home. I have heard conflicting stories about whether they work or not. My daughter used them outside and had great luck but from what I have read, they do not work at all. At any rate, if you try them, leave them whole and put them outside the home around the foundation. I have used them and told to use them outside the house because they will draw ants etc. I have successfully placed hedge apples (also known as Osage oranges) around the house without drawing ants or gnats and have left them 'til they dried up or almost rotted. It's best to place them on a saucer or in a re-used plastic container and not directly on the floor or carpet. It may also depend on what area of the country in which you live whether or not they attract ants/gnats. Added info. I think Martha Stewart recommended slicing them, letting them dry in a slow oven, and using as Christmas ornaments. They are almost impossible to cut into. My dad almost ruined a saw doing that for me several years ago. The final product was not worth the effort! When hedgeapples turn brown, or rotten, do they still work? Also, can you freeze then to use later when they are not in season? This time of year, hedge apples - the fruit from the Osage-orange tree - are being sold at farmer's markets, garden centers, and other locations. Many people have heard that these fruits can be used as an insect repellent, but the truth is that many people don't know much else about this unusual tree and its fruit. 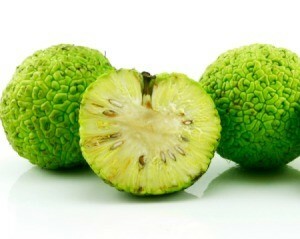 The Osage-orange is a small to medium-sized tree, having a short trunk and a rounded or irregular crown. The twigs are buff to orange-brown and are armed with one-half inch long spines. The stems exude a milky sap when cut. The Osage-orange is dioecious, meaning that male and female flowers are produced on separate trees. The small, green flowers appear in May or June. Female trees produce 3-to 5-inch diameter fruit which ripen in September or October and fall to the ground. The Osage-orange is native to a small area in eastern Texas, southeastern Oklahoma, and southwestern Arkansas. This region is the home of the Osage Indians which gives the tree its common name. Settlers found that the Osage-orange transplanted easily, tolerated poor soils, extreme heat, and strong winds and had no serious insect or disease problems. It was widely planted in the Midwest as a living fence because, when pruned into a hedge, it provided an impenetrable barrier to livestock. The development of barbed wire curtailed its widespread planting, but many Osage-orange trees can still be found in fence rows. The wood is extremely hard, heavy, durable and shrinks or swells little compared to the wood of other trees. The wood is used for fence posts, treenails, furniture, and archery bows. In fact, many archers consider the wood of the Osage-orange to be the world's finest wood for bows. Another common name for this tree, bodark, is from the French bios d'arc meaning "bow wood." This tree also produces a bright yellow dye which can be extracted from the wood. The fruit of the Osage-orange is a nuisance in the home landscape and has little value. Hedge apples are not an important source of food for wildlife as most birds and animals find the fruit unpalatable. The thorny trees do provide nesting and cover for wildlife. The belief about the use of hedge apples for insect control is widespread and persistent. it is claimed that placing hedge apples around the foundation or inside the basement will repel or control insects. A few years ago, Iowa State University toxicologists extracted compounds from hedge apples. When concentrated, these compounds were found to repel insects. Scientists also found that natural concentrations of these compounds in the fruit were too low to be an effective repellent. So, don't be fooled into spending much to use hedge apples as an insect repellent. If you decide to pick hedge apples to check out the repellency yourself or to use the fruit as a fall decoration, it would be wise to wear gloves. The milky juice present in the stems and fruit of the Osage-orange can irritate the skin. Dinah, great article, thanks for posting it. Very informative. I break out to poison ivy and tomato plants, never to a hedge apples!! I have hedge apples and I noticed one looked like it has been eaten. I also have dogs that could of eaten them, but do spiders eat the hedge apples? My family has used Hedge balls (hedge apples) for many years. They seem to work amazing for us. We just one ball in each corner of our basements. I have used Hedge Apples for years to repel what I call dust spiders in the basement. They are the spiders that have long legs, very small body compared to their legs and make cob webs in the floor joists connecting to anything from the floor to the walls. I use about 6 or 7 spread around the basement at eye level and higher. They work! What eats Hedge Apple? I've seen rodents, squirrels, and white tail deer eating them. Deer especially, when fruit is soft. Do hedge apples harm kids, dogs, or cats? This is an old wive's tale. Google it and you will see. Where you have a problem with spiders and other creepy crawling critters, put hedge apples, the "fruit" off an Osage Orange tree in the place where the spiders are and in a few days you'll not have your creepy crawling critters any longer. They grow throughout the midwest. You could call around to nurseries near where you live. They say that they grow in zones 4-9. We have hedge apples everywhere and they don't seem to help at all. I have even seen spiders crawl right beside them. I just put them by the doors and around in the garden. Am I doing something wrong? Don't pay good money for Hedge Apples! I live in Iowa "right in the Midwest" and we get lots of spiders this time of year. We use hedge apples to get rid of them disgusting spiders and they work wonderful. We live in the country and have lots and lots of hedge apples. If you would pay the shipping cost I would be more then happy to mail you a box of hedge apples. They are free for us since they grow on our property, so I am offering them to you at no cost. Only the cost to mail them. If interested then please let me know. I don't know about "hedge apples", but I do know that horse chestnuts worked for us. I've read that they are the same things, but from the pictures I've seen I don't believe that's true. We moved to a house that was totally infested with those awful little white spiders. I don't mind spiders generally, but I hate those little white ones - if you get them they seem to be everywhere. We collected horse chestnut "conkers" (the green balls with large spikes that look like a medieval mace) and put them in the corners of the room. Worked like magic. 1) I think they only work for so long; although they seemed to permanently rid our house of spiders, the same ones used at my in-laws (about three years old at that point) had much less effect. We collected fresh ones the next fall, and those seemed to work. In Central Illinois hedge apples were widely believed to repel roaches and other insects. Whether they have any value in repelling mice is not certain in my mind, but they can't hurt. In the IL tradition the apples are sliced open, exposing the fleshy parts, and indeed this may be why those who report no effect do so, they may not be slicing the apples. I can't find info anywhere explaining if you have to cut open the hedge apple to use it to repel spiders. To eliminate spiders, place hedge apples near the locations that spiders build their webs.